Keep Louisiana Beautiful (KLB) is the state’s anti-litter and community improvement organization. Affiliated with Keep America Beautiful, KLB’s mission is to “promote personal, corporate and community responsibility for a clean and beautiful Louisiana.” Founded in 2000, Keep Louisiana Beautiful’s focus in on education, enforcement, awareness, litter removal and beautification. The 39 affiliates and 23,000 volunteers improve communities and transform public spaces. Everyone knows that litter is harmful to the environment; however, knowing about the problem doesn’t solve it. In order to create a litter-free Louisiana, everyone must do their part. Keep Louisiana Beautiful provides the tools and resources needed to improve a community’s appearance and preserve Louisiana’s natural beauty. Keep Louisiana Beautiful hosted its annual state conference on September 28-29 at the Galvez Building Conference Center in Baton Rouge, La. The conference opened with welcome messages from Tricia Farace, KLB Board Member; Kip Holden, mayor of Baton Rouge; Denise Bennet, Deputy Secretary La. Department of Environmental Quality; and Eligha Guillory, Master of Ceremonies. Following the welcome remarks was keynote speaker Dr. Wes Shultz who discussed how to bring about behavioral change in hopes of increasing sustainability efforts. The topic of recycling was heavily discussed from a variety of different perspectives including Brenda Pulley of Keep America Beautiful who spoke on reusing, reducing, and recycling. Other recycling-based presentations included Refill Not Landfill by Tammy Millican, LSU; How to Make Your Case for School Recycling by Gretchen Vanicor, ULL and Amanda Waddle; Recycling at festivals by Greg Guidroz, Bayou Vermilion District; and Eco Green Events: Integrating Sustainability into Community Events and Planning by Valerie Longa, Alabama Coastal Foundation. The final session of the first day, focused on raising money to fund KLB projects, was presented by Mike Rogers of Keep America Beautiful. The evening closed with the Everyday Heroes Award Banquet, featuring keynote speaker Lt. Governor Billy Nungesser. The conference continued the following day with an opening session by Alexandra Miller of Asakura Robinson who explained planning and tools for communities to cut down on vacancy and blight, as well as calculating the cost of blight by Cecile Caron of Keep America Beautiful. Litter was a primary focal point of the discussions during the second day of the conference with speakers such as Rick Moore, St. Tammany Parish Constable; Max Ciolino, No Waste Nola; and Susan Russell, Executive Director of Keep Louisiana Beautiful. First Lady Donna Edwards along with Department of Environmental Quality Secretary Dr. Chuck Carr Brown and Octagon Media released Louisiana’s new anti-litter slogan “Love the boot, don’t pollute”. The new slogan will be featured as a bumper sticker on all state vehicles and will be available to the public for further exposure and promotion. The Coastal Wetlands Planning, Protection, and Restoration Act Public Outreach staff attended the conference as exhibitors providing information and materials to be used to educate the public on wetland and coastal restoration. 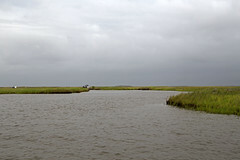 Publications such as Partners in Restoration, Understanding CWPPRA, and Henri Heron’s Louisiana Wetlands were distributed in addition to numerous editions of WaterMarks and two of CWPPRA’s Protect Our Coast posters.